Screenwriters on the films of Eric Rohmer. Zou Zou as Chloe in Chloe in the Afternoon (1972). ERIC ROHMER REMAINS one of the most revered and enigmatic directors to survive the French New Wave. His films rarely exhibit the revolutionary fervor so often associated with that cinematic movement. Indeed his chamber comedies of bourgeois desire and disappointment could easily be mistaken as nothing more than pretentious talk fests. But what keeps his feather-weight dramas and supercilious characters infinitely engaging is how their actions serve to illuminate complex philosophical and ethical dilemmas. In Rohmer’s films the focal points are never on what the characters say or do, but in the distance between those two, in that netherworld between language and action in which we all try to make sense of the world and of ourselves. Having first been a journalist, then a novelist, Rohmer never lost sight of the power — as well as impossibility — of words. He entered the French New Wave through the journal Cahiers du Cinema, serving as its editor from 1956 to 1963. When Rohmer started making films in the ’60s, he framed them as cycles (“Six Moral Tales,” “Comedies and Proverbs,” “Tales of the Four Seasons”) emphasizing their reliance on literary, rather than cinematic, genres. In 1969, My Night at Maud’s catapulted Rohmer to international fame, even garnering Oscar nominations for Best Screenplay and Foreign Film for this comedy of inaction centering around a man failing to take advantage of a sexual situation. In his next two films, Claire’s Knee and Chloe in the Afternoon, what characters do not do is always more telling than what they do. His (male) characters, bound by social convention and place, create exquisite comedies of repression just to see how far they could take their desires. In the ’70s, Rohmer experimented with historical allegory before returning in the ’80s to the breezy philosophical love stories that made him famous. In his “Comedies and Proverbs” series — The Aviator’s Wife, Le Beau Marriage, Pauline at the Beach, Summer, Full Moon in Paris, Boyfriends and Girlfriends — Rohmer made his protagonists women, examining the consequences of them trying to take control of their lives and romances. With the novelistic skill reminiscent of Henry James or Jane Austen, Rohmer turned the most banal social settings — beaches, summer vacations, a weekend of windsurfing — into the thorniest and most demanding ethical arenas. This winter Winstar Cinema has collected a select retrospective, “Tales of Rohmer,” with new 35mm prints set to tour over 30 North American cities, beginning in New York City on February 9. In tribute to Rohmer, we asked three screenwriters (and sometimes directors) — James Schamus, Larry Gross and Ira Sachs — to write about their own sense of Rohmer and why he matters. –P.B. Jean-Claude Brialy and Laurence de Monaghan in Claire’s Knee (1970). I admire Eric Rohmer for many of the same reasons I love Henry James: both find drama in the precise observance of shifting emotions. Every scene in a Rohmer film is taut with possibility; every character, on the verge of falling — falling in love, falling into melancholy, or just falling from their own sense of high and stable ground. His protagonists are an arrogant lot — his women are particularly surly — and that is what gives the films their subtle tension; we are always wondering how the mighty will fall. Rohmer’s films are made up of conversations; they are filled with nervous, talky people, who act as if language could protect them from experience. With continual attempts at self-description (“I was born to be unhappy,” says Laura, typically, inClaire’s Knee), his heroes and heroines imagine that they can talk themselves out of anything, and thus be saved from pain, or even more specifically, the surprise of emotion. And they, like all of us, are wrong. In almost all of Rohmer’s films, his characters run into themselves — they discover, or are made to discover, their own precariousness — and the result of this reckoning is always extraordinarily moving. At first glance, Rohmer seems like a very soft filmmaker. He works gently, but always, by the last reel, he has tightened the screws. Like the coming of seasons, with which Rohmer is clearly obsessed – witnessLe rayon vert (Summer) and Autumn’s Tale — we almost don’t notice the arrival of strong emotions. And then, like winter, they are upon us. Eric Rohmer has the most consistent career of any of the great filmmakers alive today. There’s not one false note in his huge and expansive body of work. In that way, again, he’s a bit like Henry James. Of no one else but Rohmer could it be said that he is making films at 80 that are as perfectly realized and as emotionally risky as the ones he made 40 years before. Rohmer uses annoyance to achieve the sublime. His trick: to make us think that personality is a kind of illusory irritant, an encumbrance that keeps us from our presumed moral centers, but which, finally, turns out to be the very register of our moral being. Think of Delphine, the irrititatingly depressed secretary heroine of Le rayon vert (1986) — and one of the great mise en abymes of dialogue in cinema history: she’s at her friend’s summer cottage, an outsider surrounded by solicitous friends of friends, and she refuses the barbequed pork, politely explaining that she’s a vegetarian. A polite query follows: “Should we prepare you something else?” “Sorry, we didn’t know of your specific dietary needs.” She tries her best to brush it off, but as she talks, and the more she talks, the more absurd, grating, hostile, self-defeating, alienating, tragic, weepy her explanations and excuses become. Rohmer creates an embarrassment so exquisite, a self-consciousness so finely attuned, this little scene takes on the psychic dimensions of a Busby Berkeley musical number, and all in glorious 16mm. I went to Rohmer’s My Night at Maud’s, with my 19-year-old brother, the week that it opened in a subtitled version in New York. 1967, I believe. I was 14. I enjoyed it a lot. The enjoyment was enhanced by a certain bewilderment, which I confess, I haven’t entirely gotten over after all this time. Here were three adults, who looked like adults you knew from everyday middle-class life, and all they did was what people you knew did. They discussed their past relationships, stuff they’ve read, and they expressed their opinion of things that mattered to them. So little happened, and yet it was somehow entertaining and never boring — but you couldn’t quite tell how it could be so entertaining and avoid being boring. Obviously some of it had to do with the three central performers, Jean Louis Trintignant, Francoise Fabian and Marie-Christine Barrault. Trintignant in particular does something in the film that has only grown in significance with the years. He supplies a near perfect image of an intelligent man in love. A compelling alternative — and one of the few — to the silent, stoic, macho-killer tradition of Cinematic Masculinity embodied by John Wayne and Clint Eastwood. I would point in particular to the scene late in the film where Trintignant stands on a snowy hill with Barrault and hears about some unsavory details of her past love life. In that moment his expression of tenderness, disappointment, along with his determination to keep loving this woman define for me a type of conscious intelligent masculinity that has all too rarely found embodiment in cinema — or in real life. Indeed if I were to attempt to explain to a super-intelligent alien why the male race shouldn’t be erased from the order of things, I’d start by showing Trintignant in this film. There are so many great things about this movie. It demonstrates brilliantly one of the iron laws of romantic comedy. When a plot turns on a character’s choice of mates, the stronger the “wrong” one is, usually the better the movie. Other demonstrations of this principle include the temptation James Stewart offers Katherine Hepburn in Philadelphia Story or the alternative Kristin Scott Thomas presents to Hugh Grant in Four Weddings and a Funeral. In the latter case she’s almost “too” attractive an alternative for the movie’s denouement to be entirely credible. Here Francoise Fabian’s Maud truly represents all the mysterious roads not taken by all of us in our romantic lives. I remember my brother being unusually somber and meditative on the subway ride home after the movie. I asked him why, and he explained that it was truly painful to contemplate all the excuses one offered oneself for not having pursued or followed up with certain women. I didn’t entirely get what he was saying at the time, but 30-some years have gone by and I sure do now. Two other things. This was the first film I ever saw photographed by Nestor Almendros. Although it was almost all interiors and close-ups, I knew without quite knowing how or why that the black-and-white images had a crispness and delicacy fundamental to the film’s mood. It was the beginning of a vague understanding on my part that to be “cinematic” didn’t necessarily mean epic locations, lavish production values or overpoweringly flashy visual mannerisms. Finally I remember being puzzled and charmed by a unique fact about how this film was edited. Rohmer often chose to stay on the character, listening rather then always cutting back to the person speaking. Once again, without knowing why, I got the feeling that there was something momentous about such a procedure. Last-minute preparations are made before the opening ceremony of the Beer Can House. 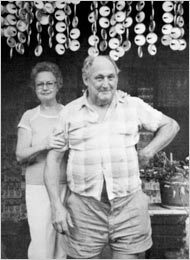 John Milkovisch, left, with his wife, Mary, spent 20 years at work on what is known as the Beer Can House. From 1968 until his death 20 years later, Mr. Milkovisch, an upholsterer for the Southern Pacific Railroad, not only emptied 50,000 cans or more of his favorite beverage but also put the containers to good use, cladding his house and workshop with thousands of maintenance-free flattened beer cans (Falstaff was a favorite) and shading the sun with garlands of tinkling beer can tops and tabs.Known to generations of sidewalk gawkers as the Beer Can House, the folk art monument was dedicated Thursday and will open to the public on Saturday for the first time since its purchase from the Milkovisch family and a seven-year restoration project totaling $400,000.“Most people who take the lead in doing something truly innovative are considered a little bit crazy,” said Mayor Bill White, cutting a ribbon and paying tribute to “the hard work of generating all those beer cans.”Inside, a quote from Mr. Milkovisch adorns a wall. “They say every man should leave something to be remembered by. At least I accomplished that goal.”What may now be Houston’s second-zaniest spectacle was bought by the zaniest — the Orange Show Center for Visionary Art, a foundation growing out of one man’s obsession with his favorite citrus fruit.Working alone from 1956 to his death in 1980, Jeff McKissack, a Houston postman, built a maze of connected chambers, balconies and tiled walkways extolling the health benefits of oranges. The structure costs a dollar to tour, the same as the Beer Can House.Marilyn Oshman, the art patron who founded the Orange Show, said it was no accident Houston played host to such attractions. “One good thing about not having any zoning is you can do stuff,” Ms. Oshman said.